I thought, with the long overdue departure of Karl Stefanovic, who so unfairly attacked the industry after the Brisbane floods that I stopped watching the Today Show, that we would be getting more balanced reporting by the media. However, no doubt picking up on the Deputy Premier’s call for banks and insurers to “lift their socks” and show compassion to North Queenslanders’ affected by the floods, we have seen the attacks on insurance start all over again by both Channel 9 and the ABC. 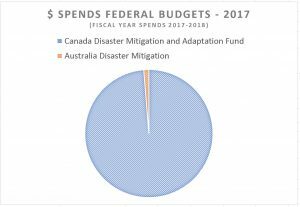 Wouldn’t it be nice to see a journalist ask the Deputy Premier or the Federal Government how much they, as the protectors of our economy and the electorate, have they spent on flood mitigation over the past few years? As I pointed out in an article a few years back, Australia has a pathetic track record compared to Canada. 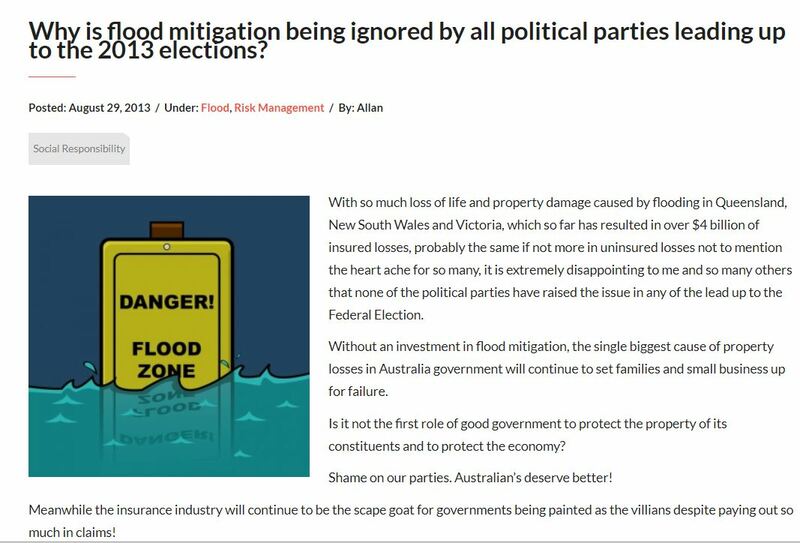 The issue was completely ignored in the 2013 elections [see post] and my genuine hope that some good will come out of this event in that flood mitigation will be put on the agenda by all sides of politics moving forward starting with the upcoming Federal Election. Another good question would be, why did the Queensland Government increase stamp duty on insurance immediately after the Brisbane floods to make insurance less affordable? New South Wales is even worse with their planned increases in Emergency Services Levy which to their credit, the Bjelke-Petersen government abolished in 1986. Until such time as developers and local councils stop allowing building in known flood zones and government work to fix the problem that has been created by decades of poor planning in both where to build and how to build families and business owners are going to continue to be set up to fail. 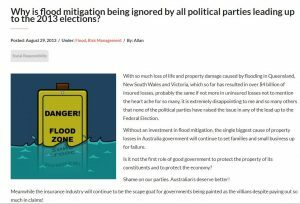 Private enterprise cannot keep paying for claims over and over again, particularly for people who have elected not to insure for the peril of flood. The frequency and severity of weather related losses as we have all witnessed over the past 10 years is enormous with no suggestion things are going to get better. While it is easy for government to divert the attention away from their own shortcomings it achieves nothing to solve the problem which is likely to only get worse with the cost of insurance likely to increase to meet the cost of claims. To explain the different types of insurance coverage available I have prepared the attached paper. I hope it is of benefit to readers should you be trying to explain it to any of your friends, family or customers. Allan, this industry bashing has been going on for years . 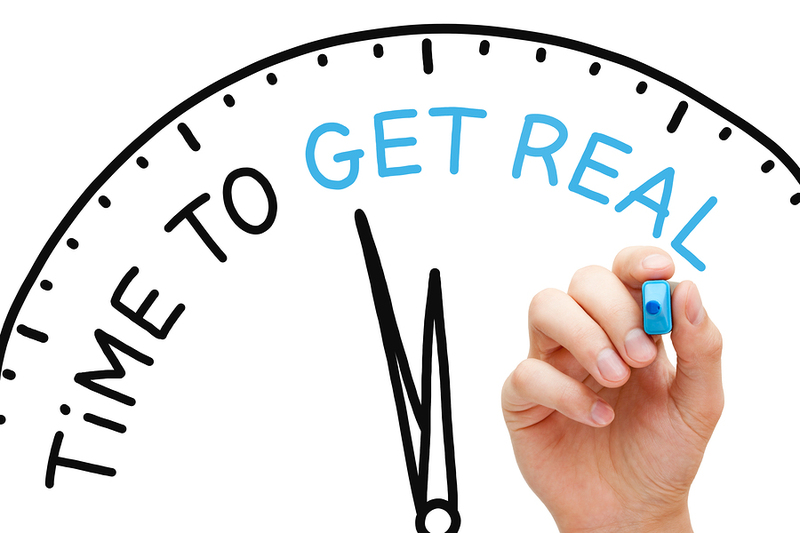 I know our industry advertises to write business but maybe we need to do a bit more as an industry to put facts out like you note in your blog with some advertising showing some of the responses and positive feedback. Maybe if you find an unbiased media outlet you could send them this blog, maybe it would be published, chances are it wouldn’t .